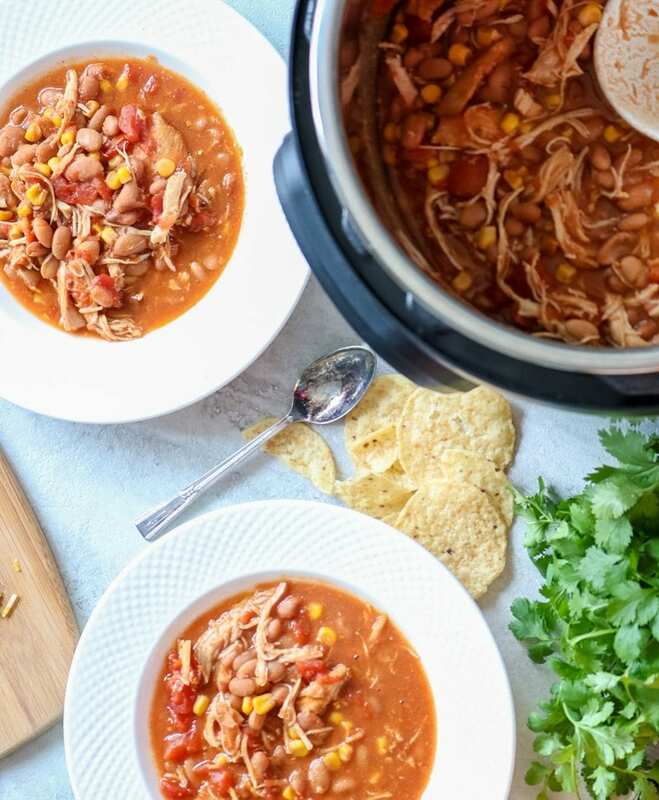 Instant Pot Chicken Chili with Dried Beans: A hearty and healthy chicken chili has never been easier with the help of a pressure cooker. Start with frozen chicken and dried beans and a few pantry ingredients and less than 90 minutes an easy family dinner will be on the table. Prepare to have your mind BLOWN! Start with dried beans and frozen chicken and a delicious hearty chicken is ready in less than 90 minutes. And yes, that does include time to come to pressure, cooking time, and natural release time!! I have been asked over and over again how to make my Classic Chicken Chili in a pressure cooker. My first advice was to just use my recipe for chicken chili, dump into the Instant Pot set for 20-25 minutes on high pressure and bam, a healthy chicken chili for the Instant Pot. 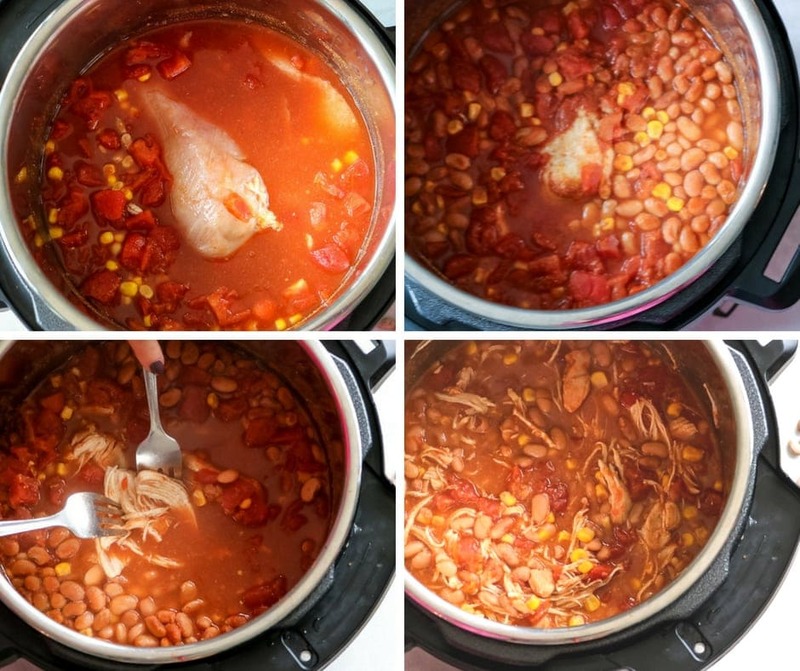 But then as I thought about how I make frozen chicken breasts in the Instant Pot and dried beans in the Instant Pot, I wondered if I could use those recipes as a base for making Chicken Chili using dried beans AND frozen chicken. And you can–picture me doing a happy dance right now, because not only is this Chicken Chili easy, it is healthy and darn good! You may be thinking why in the world would I use dried beans instead of canned beans in chili. You can control sodium content when you use dried beans over canned beans. Because dried pinto beans take 30 minutes to cook fully, I opted to use frozen chicken breasts in this chicken chili recipe so the chicken would not dry out and be over-cooked. 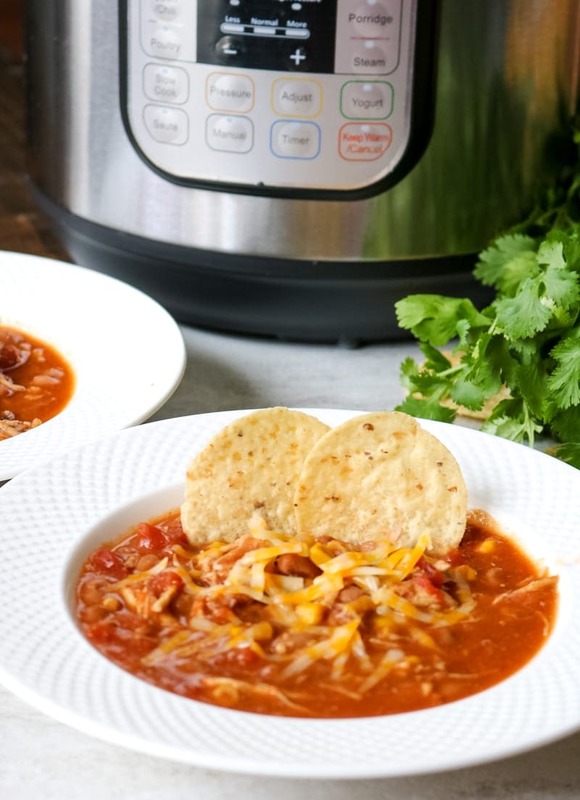 How would you change the recipe to make this Pressure Cooker Chili using fresh chicken and canned beans? Use 1 pound fresh chicken instead of frozen chicken. Use 2 15 ounce cans of pinto beans rinsed instead of the 2 cups of dried beans. Decrease the liquid from 2 cups of stock to 1/2 cup stock. Everything else (ingredients, release time, time to come to pressure) remains the same. 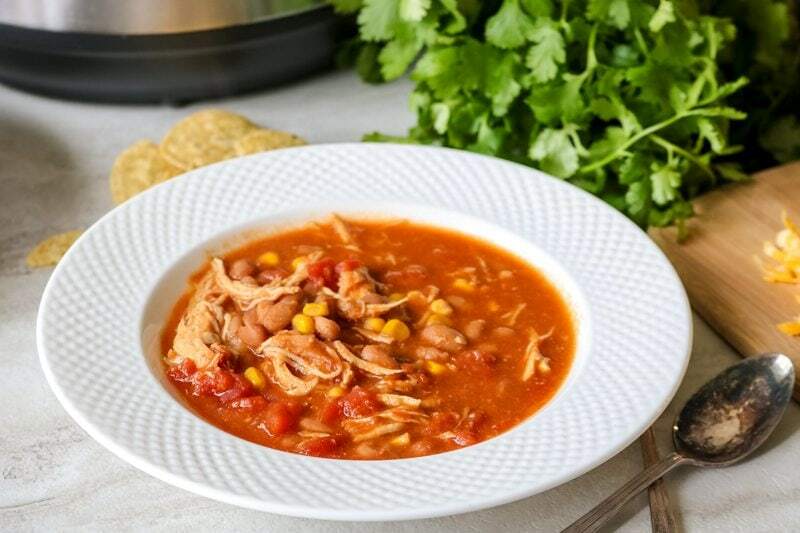 Can you make Chicken Chili with fresh chicken and dried beans in pressure cooker? Technically, you can make Chili with fresh meat and dried beans. But as chicken over cooks easily, it is possible to dry out your chicken at the 30 minute cooking time required to cook the dried pinto beans. This is not my preferred method for cooking Chicken Chili. Can you make Chicken Chili with frozen chicken and canned beans? Adjust the cooking time to 20 minutes instead of 30 minutes on high pressure. Use 2 15 ounce cans of drained pinto beans instead of dried beans. Step One: Place everything into the Instant Pot. I know, hard, right?! Step Two: Let chicken chili cook on high pressure for chicken to be cooked though and dried beans to become tender. Let pressure release. Step Four: Serve chili with chips, cheese, sour cream, cilantro, etc. Be sure to add the tomatoes on top of the broth and not mix into it the chili. This helps the tomatoes not burn while cooking–you can ust mix them in at the end. If you would rather use black beans instead of pinto beans just substitute the dried (or canned) black beans for the pinto beans and follow the recipe as stated. Or use 1 cup dried pinto beans and 1 cup dried black beans. If you like peppers in your chili, add 1 diced pepper. Frozen corn is optional in this chili. This Gluten-Free Chicken Chili is fabulous served topped with cilantro, sour cream, shredded cheese and tortilla chips. I like to serve the leftovers of this pressure cooker chicken over baked potatoes. Be sure to check out all my easy, healthy Instant Pot recipes. Pressure cooker Chicken Chili starts off with dried beans and frozen chicken for one of the easiest meals you can have. Place all ingredients in pressure cooker but the tomatoes into the pressure cooker and stir. And in the diced tomatoes and do not stir in. Place lid on pressure cooker and turn valve to "seal." Set to high pressure for 30 minutes. Once cooking time has stopped, let pressure release naturally for at least 25 minutes before manually releasing pressure. Wow! I love how easily this comes together with little effort for a hearty, comforting meal. Great use of the instant pot! Absolutely! The ease of this recipe can not be beat Tara. Thanks for sharing these awesome tips as pressure cooking can be so daunting for me at times. You be Felesha! 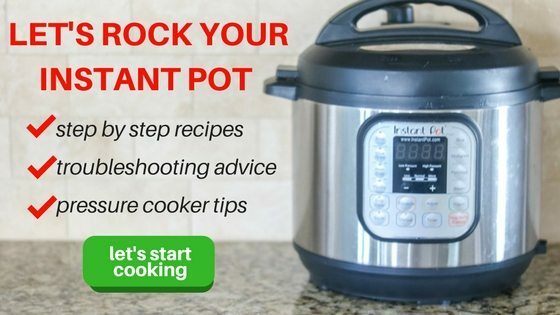 Be sure to check out my Instant Pot 101 to really help overcome your fears using a pressure cooker. i still need to get an instant pot! this looks so great – perfect for 10 below zero weather! Oh man that is COLD!!! And yes, you need to get an IP! Loving all your tips! We just got an instant pot for the holidays – this will be a great recipe to try with it! This is a super useful post – you’ve given so much information on cooking techniques and substitutions. And of course, it looks and sounds perfect for early January – bright, healthy and delicious. I saved this recipe- I love finding new ways to use my Instant Pot! Thank you! Yay!! Thanks Jessica. Hope you enjoy! This sounds amazing. I need to get myself Instant Pot asap. I can’t believe that you used dried beans and it came out so good. Love this recipe. Great recipe. I especially appreciate your variations options. Thank you! Absolutely Alicia! I really do want to give you as many variations as I can think of so you can easily make Chicken Chili at home and enjoy it based on your family’s preferences! As an instant pot newbie, this will be on my menu next week! This looks fabulous and something I can easily throw together after work! Thanks for sharing! Hi Myranda! You absolutely could use boneless, skinless chicken thighs. The time for this recipe should not change. Did you soak the beans first? If not, how would you adjust the cooking time for soaked beans? Hey Nancy, sorry for my delay in getting back to you. I did NOT soak my beans, the timing should not change at all though! I hope you enjoy! I made this recipe last week using dried black beans because that’s what I had- I also added frozen chopped peppers. It was so delicious! Kind of a mix between chili and black bean soup. So so yummy and easy, and I love that I could whip this up with ingredients I already had. Although I will say it took my IP much longer than 15 minutes to come to pressure- no big deal though because I always make my chili the day before I want it. Your chili looks great! I’m chili with chicken. I am going to make a variation of this tonight. Do you drain the canned tomatoes? Hi TJ! I do not drain the tomatoes, that juice will help the chili pressurize and the dried beans cook properly. Enjoy! Thanks for the recipe! I keep coming back to it because I keep making various bean dishes with frozen chicken. So far my favorite has been a mix of pinto and black beans, 3 frozen bone-in chicken thighs (the meat slides off the couple bones easily and shreds well, and is very cheap, and I think has more flavor) and I substitute 1 can of tomatoes with a 15oz jar of salsa Verde. I also cut up a big ol onion and use the saute setting (after chopping it of course) before I add everything else. Comes out great! Thanks again! Thank you so much for sharing your review Vox! It makes my heart so happy to hear when others enjoy my recipes. And I am going to try this with Salsa Verde–sounds like a great idea! Thank you for sharing this super simple recipe that even a sleep-deprived mother of a toddler and newborn can do :). I had just under 2lbs of frozen chicken breast (skin-on, bone-in) and added 1.5 cups more broth and 3 extra minutes of cook time. It came out perfectly. I think even the skin and bones helped the chicken stay more tender during cook time! Oh I love to hear that this meal helped you out when you are balancing so much!!! I love that you used what you had on hand as well. How would you adjust this to be made with frozen chicken tenderloins and canned beans? Would you still use NPR? Thanks so much for sharing a great recipe!! Hi Molly!! You are so welcome for this recipe–I hope you enjoy! For frozen chicken tenderloins and canned beans just as you would with frozen chicken breast and canned beans. what version of the insta pot do you use? There are so many choices. Not sure which one I should buy. I want to use same one you use. And what size? This was the first recipe I made in my new InstaPot. It was delicious but way too watery. I used fresh chicken and canned beans. I think the liquid needed to be adjusted since the beans weren’t absorbing the liquid. I prefer a more chili like consistency. Any suggestions? Hi Cate! You are exactly right, the amount of liquid would need to be decreased for a thicker chili if you are using canned beans. I am sorry you missed that modification. I stated to reduce the chicken stock/water/beer (whichever you use) from 2 cups to 1/2 cup–sorry you missed that. You could drain off some of the liquid if desired. Sorry about that. Could you double the recipe? I assume you’d need to add more cook time..? Hi Karen! As long as your pressure cooker will hold double the amount and still not be more than 2/3rds full, you can double. The cook time will remain the same, but the amount of time it takes to come to pressure will be longer. Enjoy! I guess all pinto beans are different – mine (from dry) were not done after 30 minutes; I added another 20, then an additional 10 and at that point they were firm but good. Luckily the (frozen) chicken did not turn out rubbery after 60 minutes of cook time!! Hi Emily! Sorry dinner took so long! I have heard that if your dried beans are older this can happen. I am glad you all still enjoyed dinner! Do you add the frozen chicken whole or sliced? Seems to me at some point you need to shred it. I add the chicken whole and then shred in the pot (or on a cutting board) after cook time. I hope you enjoy! Hey girl my wife can’t eat tomatoes is there a sub. that I can? I would use 4-5 cups chicken stock instead of diced tomatoes.